"Pirates have their own crude tradition of flags and symbols." As the rather stuffy writer of the Bestiary states, "Pirates have their own crude tradition of flags and symbols." This is true in the real world as well, though I actually think that pirate flags are a rather fascinating topic. And given just how blood-drenched some real-world lords and knights were, I’d accord their heraldry the same amount of respect as I would a pirate flag. That is no actual respect at all, just a healthy dose of terror. So, pirate flags. Your fully traditional flag is the Jolly Roger, a human skull with two long bones crossed underneath it, white on black. This symbol significantly predates its use by pirates. It possibly came about because it was common to arrange skulls and bones like this in ossuaries, or out of the medieval dance of death symbolism. From there it found its way to military insignia, used to denote fierceness, to say "not only will you die one day, that day will in fact be today because I am running you through with my sword now". And from there to pirate flags. The point of flags in general is communication, and the point of a pirate flag in particular is to scare the viewer into submission. Pirates didn’t actually want to fight, they wanted to plunder and get away with the least amount of effort. And so it was as important to look fierce as to actually be fierce. 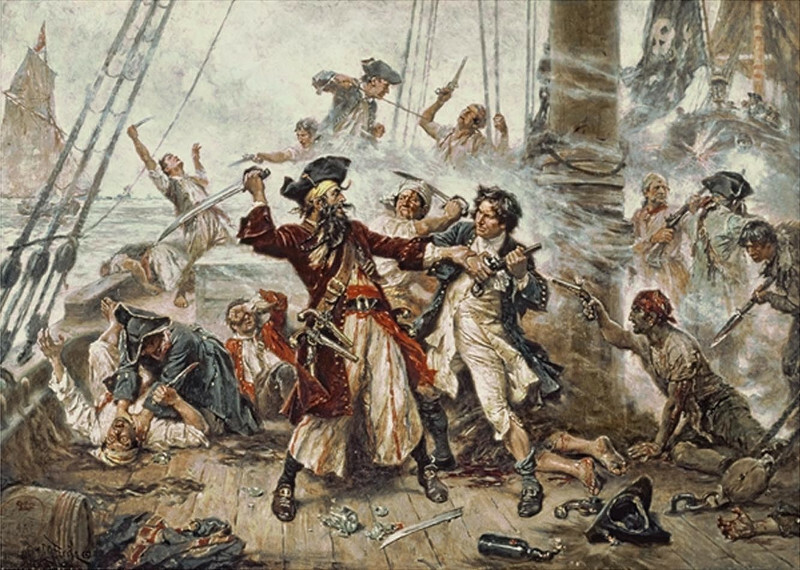 Blackbeard, probably the most famous pirate of them all, cultivated a fearsome image, but did not do that much fighting, and treated his captives reasonably well. After all, ransom money does not flow if your captives are assumed to be dead anyway. Beyond the skull and crossbones, pirates used a number of common symbols, all on the theme of death. Skeletons were popular, especially dancing ones. 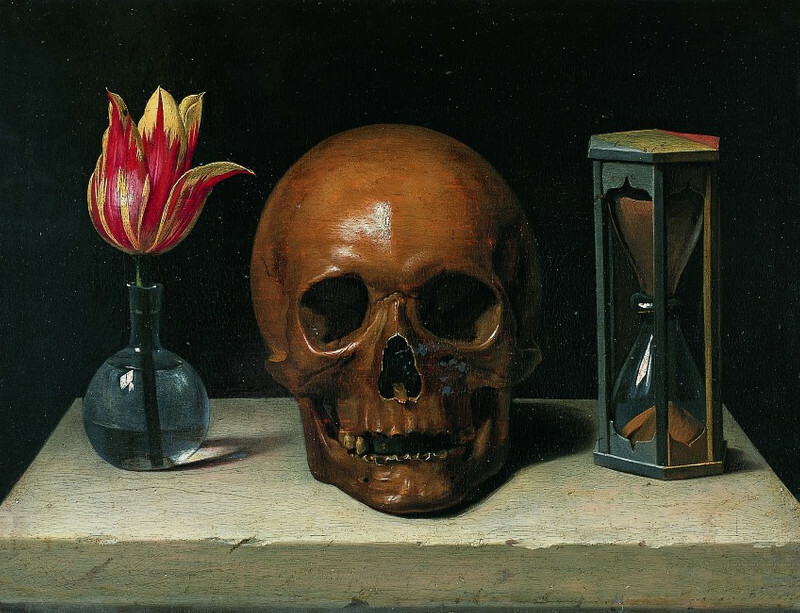 Hourglasses were also common, another element borrowed from memento mori imagery: your time has come. Two questions still vex us. Why were pirate flags called "Jolly Roger", and were they always black? "Jolly Roger" did seem to be the generally accepted term for pirate flags. It may have come from "Old Roger", a nickname for the devil. Other theories include derivation from "Ali Rajah" (king of the sea) or "Joli Rouge" (pretty red), though Wikipedia insists the latter is clearly false. But wait, "pretty red"? Pirate flags are black! It turns out to have been a bit more complicated than that, which brings us back to the idea of flags as communication. Most of the time, pirate ships did not fly a pirate flag at all. There was no point in bringing unwanted attention to yourself, after all. And indeed, mere possession of a pirate flag was seen as sufficient evidence to convict you of piracy! Instead, pirates flew some harmless-looking flag, and only hoisted the pirate flag when it was time to strike. In other words, they were "sailing under false colours" and "showing their true colours" only when attacking. And at least in some cases, pirates actually had two flags, a black one and a red one. When approaching their prey, they would hoist the black flag and fire off a warning shot. If their prey then surrendered, they would "give quarter" - not harm anyone, and simply take their valuables. But if the other ship tried to flee or fight, the red flag would be raised, meaning "no quarter". The pirates would take the ship by force and show no mercy. This mattered because pirates were not the only possible attackers for merchant ships. Vessels of governments at war with the ship’s country would do "commerce raiding", and so would privateers commissioned by such governments. But both were required to give quarter to civilians. They could not threaten to slaughter the merchant ship’s crew, and so even though their ships might have been stronger and faster than pirate ships, it was safer to resist them. Pirates, operating outside the law, had no such limits. A privateer might be better-armed and faster, but a pirate was still far more dangerous. Interestingly, this was much the same tactic as used by the Mongols in their conquests. 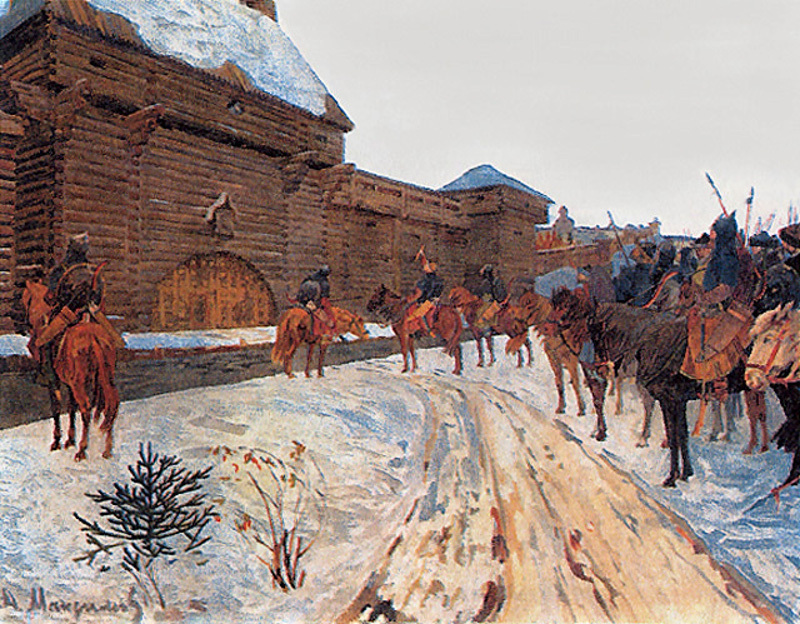 The Mongol army would arrive at a city and give them a choice: surrender, and pay tribute, and be spared. Or resist, and if we breach your walls, we will put you to the sword. A few survivors would be allowed to escape, to spread knowledge of the terror of the Mongol horde. Soon, even cities with very good chances at resisting a siege would surrender rather than open themselves to the possibility, however slim, of wholesale slaughter. So there you go. To get what you want, all you need to do is persuade people.